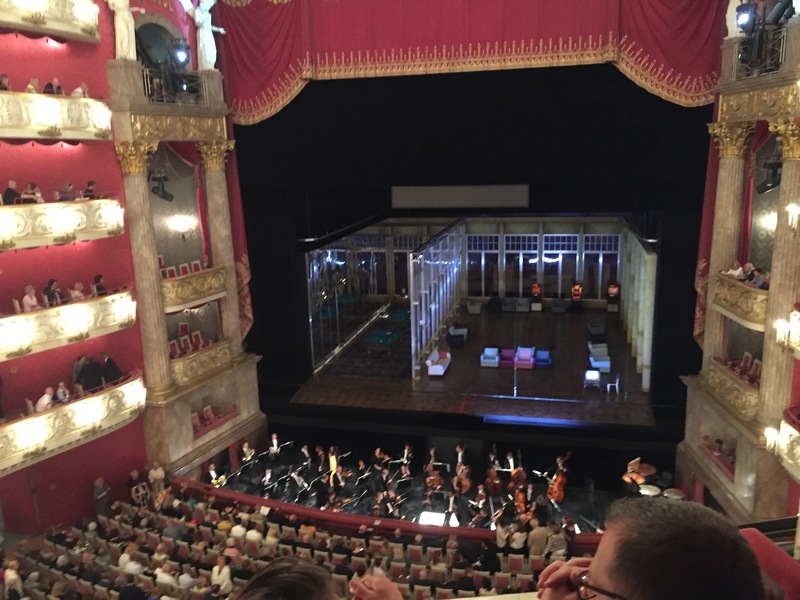 It has been already quite a time since I enjoyed fantastic performances at Bayerisches Opernfestspiele or Munich Opera Festival. For me it is second year in a row when I carefully plan extended weekend with great hope to get all wished- for tickets from the Bayerisches Staatsoper box office in line with priorities defined in some 8 or 9 months ahead planned request letter. I have been more than lucky this year, as all 3 performances I was praying for have been allocated with relatively good seats (one bad seat and 2 excellent choices). 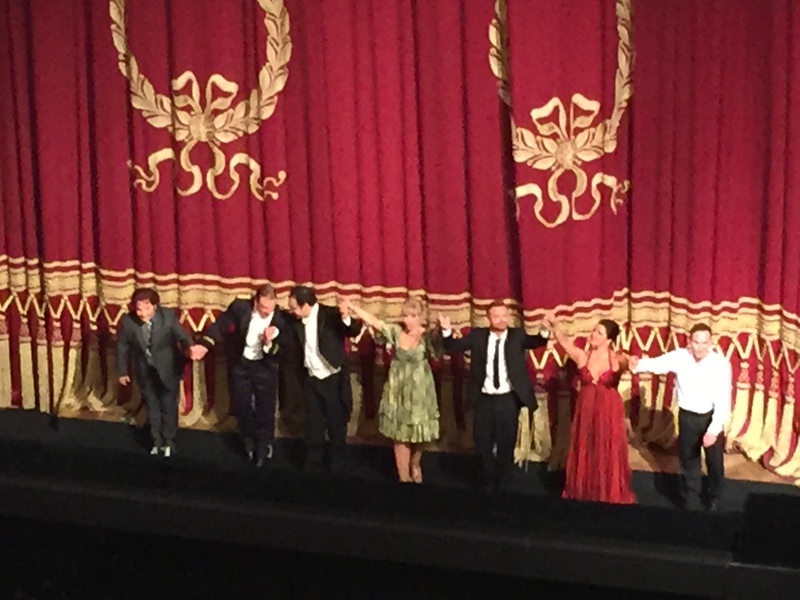 From the list submitted I was most intrigued by Eugene Onegin, not only because of the famous production per se, but also due to interesting cast changes as Anna Netrebko promised to sing Tatjana as she resigned on last minute from Hans Neuenfels production of Manon Lescaut last year. The storyline of the opera is well known to most, so the intrigue created by Krzysztof Warlikowski lies mainly in more complex relationships of protagonists and interpretation of the hints found in Pushkin poetic verses and romantic music of Tchaikovsky. There were several topics to explore more in depth. Who is Tatjana? Is she young and innocent girl fallen to charms of seducer Onegin? Is relative coldness and indifference main magnet for her as she interprets his behaviour alike to her, being distant to the majority of society around her, being outlier as well? Or she is already internally mature woman who understands how this unrealistic infatuation is going to destroy her future in the societal circumstances? It seems than Anna Netrebko has even more complicated director’s idea since her interpretation brought very clearly Russian aspect of the character, adding some light sadness and longing for unreachable ideals, cultured by novels and poetry intensely read by the heroine. Anna Netrebko created her own character, assuming not exactly in line with interpretation actually foreseen by Warlikowski. This might have been intended by director as discovery of maturing by naive and simple country girl, which did not come through with appearance of our all-star diva Netrebko. Anna was totally believable, changed from confused girl to mature and responsible women who knows her priorities and is not ready to sacrifice love for fleeting passion. She knows for sure what are her values. Even if probable happiness once was so close and so possible..
Anna Netrebko was in top form, her timbre is beautifully round and even, and in dramatic moments, when emotions are over edge, her tone stays clear. This is not the role where she could demonstrate beauty and depth of her middle and lower range, and seems like the role is fitting her voice incredibly well. Theatre burst after Tatjanas aria, Netrebko proved that she is not only outstanding singer but also superb and masterful actress, fully believable, and able to raise goosebumps with her incredible immersion in the role. Was there soulsearching by Onegin? No, as he does not tolerate anyone being emotionally involved and wants to destroy it as being unable to love himself.. What are hidden and repressed emotions towards Lensky? Why suddenly love for Tatjana? Because Gremin has tender passion and loves her? Onegin here is egocentric sociopath, he does not know who he is and what he wants, but expects everyone to cater to his needs, and if threatened, to kill and run. Internal drama heats up when considering suicide as the only possible escape from reality and himself, and haunting cowboys ironically go on with their never ending polonaise.. Has he undergone transformation towards the end of the story? Has he learned his lessons by paying so dear price? Mariusz Kwiecien delivered the role with utmost credibility. 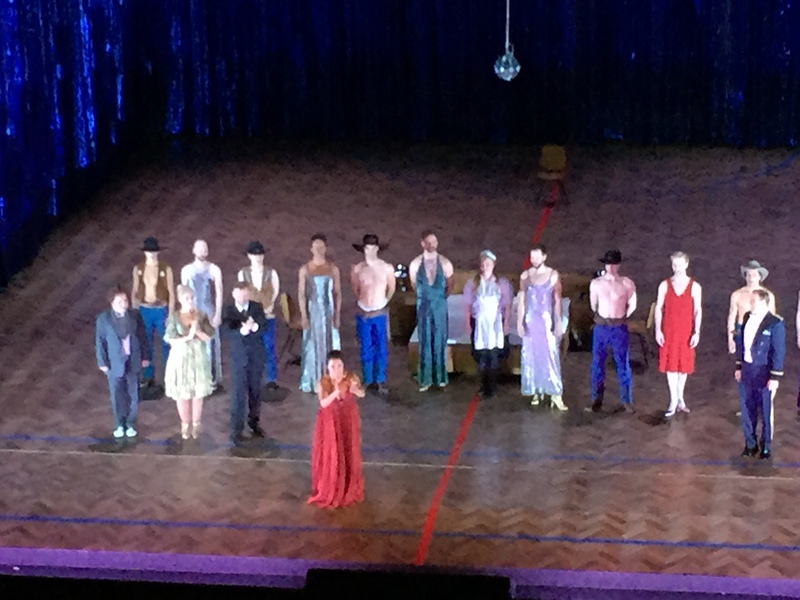 I have seen performance a month ago, and a lot of impressions are overridden during week in Salzburg, nevertheless, this show has stuck to my mind, and especially fantastic interpretation and portrayal of Onegin by Mariusz. They were great scenic couple with Pavol Breslik as Lensky, both talented singing actors, playing their roles even when not in the limelight of the scene. Small details that create overall story were there to stay. Main discussion around the production is its “Brokebackish” flavour and homosexuality issue raised to attention. As I have perceived the story more from perspective of friendship becoming something more and developing in a ways you might not be able to predict, starting from close bonding of two young men who have so many things in common, and sharing their experiences towards adulthood, then transforming into something they both can’t even name, as being mix of fraternity, love, jealousy, anger, competition and self-actualisation. One of the roads leads into dominant theme defined by Warlikowsky, but still I believe that the story is more complex, and involves search of real self. Breslik has nice voice though compared to Kwiecien a bit quieter, smaller, but nevertheless dramatic acting of both guys was superb, I was mesmerised by watching the story unfold. There was one aspect of the production that did not convince me fully, as the story has been brought 100 years later than originally written by authors into 1970ies and Texas. This is the closest link to “Brokeback Mountain” but at the same time justification of such timing was not clearly understandable. Other cast was supporting the main characters quite well, Alisa Kolosova delivered credible, stable and likeable Olga, while Larina and Filipjewna due to language barriers were hard to decipher. Günther Groissböck delivered outstanding performance as Gremin, and it was interesting to see him in completely different role as Saretzki just shortly before his main role. The choir at times sounded a bit clumsy, probably mostly due to close to non-existent diction, sometimes there are misalignment with orchestra which might have been caused by festival scheduling having just a few rehearsals before the run with new conductor. Conductor Leo Hussain gave a bit faster tempo, especially in the beginning when it sounded like Tchaikovsky in twist like manner (scene with living room karaoke). Regardless of production running since October 2007, some people perceived cowboys and transvestites as too much, some people booed, clearly indicating their disapproval during end of the scene and curtain call. 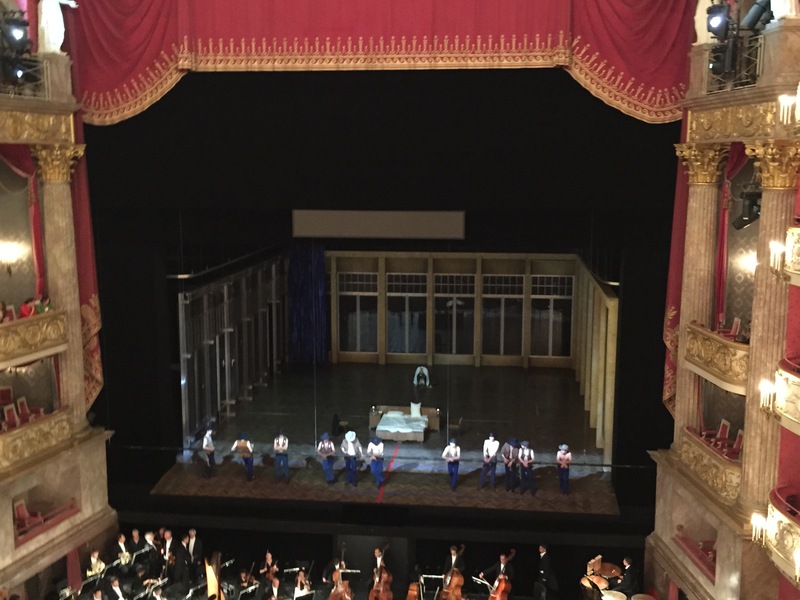 Summarising, Eugene Onegin was the most dramatically charged, emotionally fulfilled and impeccably sung performance by a cast of the best dramatic singing actors you can find. Questions raised by director Warlikowsky openly and also those just hanging in between the lines are as burning as more than 100 years ago, as we are still so much tended to ignore, reject or forbid anything that does not correspond to our ideal view of the world. Performances like this one make each of us a little bit more tolerant and better human being. 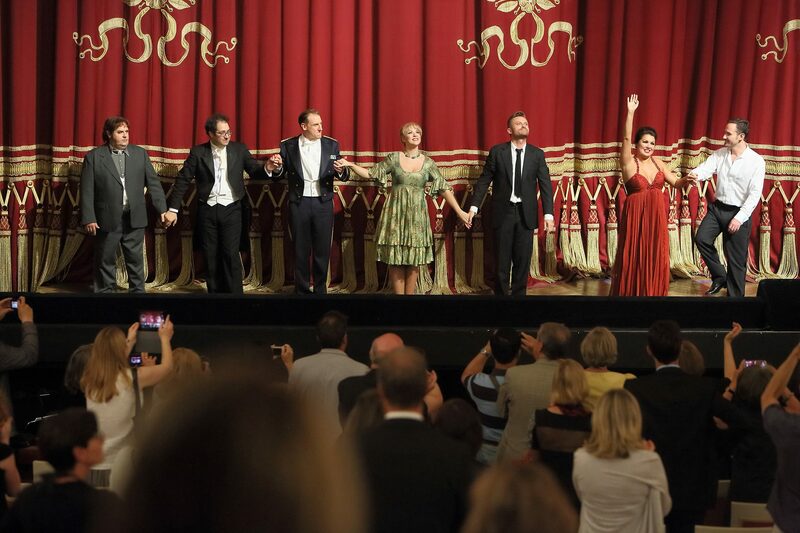 Will try to catch another run when back in Munich..
Curtain call, photo from Bayerisches Staatsoper Facebook page. Reblogged this on de chareli.